f you’re not completely sick of pumpkin, here’s another recipe to consider. I baked up a batch of these last night and they are excellent. They’re tender, relatively high cookies. I made this batch with pecans, but you could sub walnuts. Next time, I might leave out the cinnamon and use chocolate chips. At any rate, these will satisfy a pumpkin craving. Combine flour, oats, baking soda, cinnamon and salt in medium bowl. fluffy. Add pumpkin, egg and vanilla extract. Mix well. Add flour mixture. Mix well. circle or oval. Repeat with remaining dough. 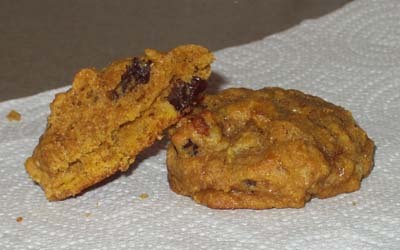 Bake for 14 to 16 minutes or until cookies are firm and lightly browned.